The species is widespread throughout Britain, more scattered in the north. It is widespread in western and central Europe. 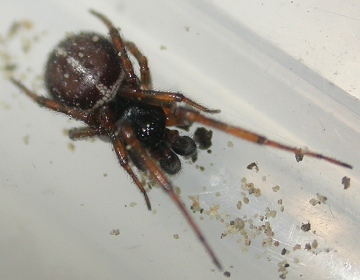 This spider is mainly found in and around buildings but also occurs on old and dead trees where it lives under bark and in the dry litter collected in rot holes and other cavities. In common with others of the genus it preys on crawling invertebrates. The typical scaffold webs include viscid lines that are attached to the substrate under tension. The struggles of the captured insect break the attachment of these lines thus lifting the unfortunate captive into the air and leaving it suspended ready for the spider to deal with. Both sexes are mature throughout the year and females may survive for several years.